Colin Jacobs scored a goal and an assist Friday as Prince George rolled to a 3-1 preseason victory over defending WHL champion Edmonton. The goal, which came off a deflection in front of the Rockets cage late in the second period, gives Jacobs a multi-point game in just his second outing as a Cougar after having just two in all of 2011-12 with Seattle. Alex Forsberg ('13) added a pair of assists for Prince George, who moved to a 3-0 thus far in exhibition play. The two teams will go back at it on Saturday in Prince George. In Finland, Joel Armia notched an assist as Assat completed their preseason with a 4-2 win over Ilves. Armia, who continued to man a scoring line right wing spot, was unable to light the lamp in any of his four exhibition appearances. The Aces open the regular season Friday at Lukko. 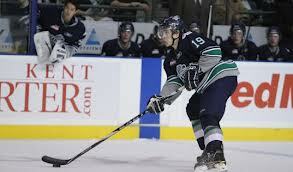 Elsewhere, Logan Nelson finished even with a roughing minor in Victoria's 4-1 win over Kelowna. The two clubs will play a rematch of their fight-filled affair Saturday in Kelowna. In the OHL, Brady Austin recorded a power play assist as Belleville was doubled by Kingston, 6-3. The two clubs will play a rematch on Saturday. Alex Lepkowski did not point as Barrie dropped a 4-1 decision to Guelph. The Colts next take the ice on Sunday when they take on Kitchener. In USHL action, Judd Peterson was -2 with three shots on goal as Cedar Rapids opened the exhibition schedule with a 5-3 loss to Dubuque. The two clubs, which combined for 99 penalty minutes on Friday, will resume the home-and-home battle Saturday in Cedar Rapids.